Wire, wood and fabric aircraft served as an appropriate backdrop to the book launch of the very recently published ‘The Australian Flying Corps in the Great War 1914-1918’, co-authored by Norman Clifford and Lance Halvorson. 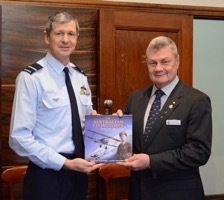 The book launch took place in the RAAF Museum on Monday 28thMay, followed by a light lunch at the former Officers’ Mess at RAAF Williams Point Cook. 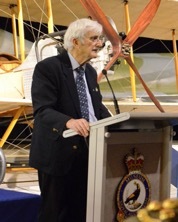 Peter Meehan, OAM was Master of Ceremonies. AIRCDRE Glen Braz, CSC DSM representing CAF, BRIG Stephen Jobson, CSC Commander 16thAviation Brigade, AVM (Retd) Alan Reed, AO DFC (US), GPCAPT Dennis Tan Officer Commanding Air Training Wing, and WGCDR James Rogers Commanding Officer No 21 Squadron were among the VIP Guests. Copies of ‘The Australian Flying Corps in the Great War 1914-1918’ can be purchased by contacting Barbara Stallard at office@raafavic.org.au. Below: Lance Halvorson is a retired RAAF wing commander navigator who served in No 2 Squadron during the Vietnam War. Both gentlemen have a passion for military aviation history. Below: Norman Clifford is an accomplished self-taught artist specialising in military aviation, who researched over many years the history of the AFC. His research involved examining AFC operational orders, interviews with several long-lived WW1 aviators, and log books. Below: Carl Schiller, National President AFA presenting a copy of the book to AIRCDRE Glen Braz.